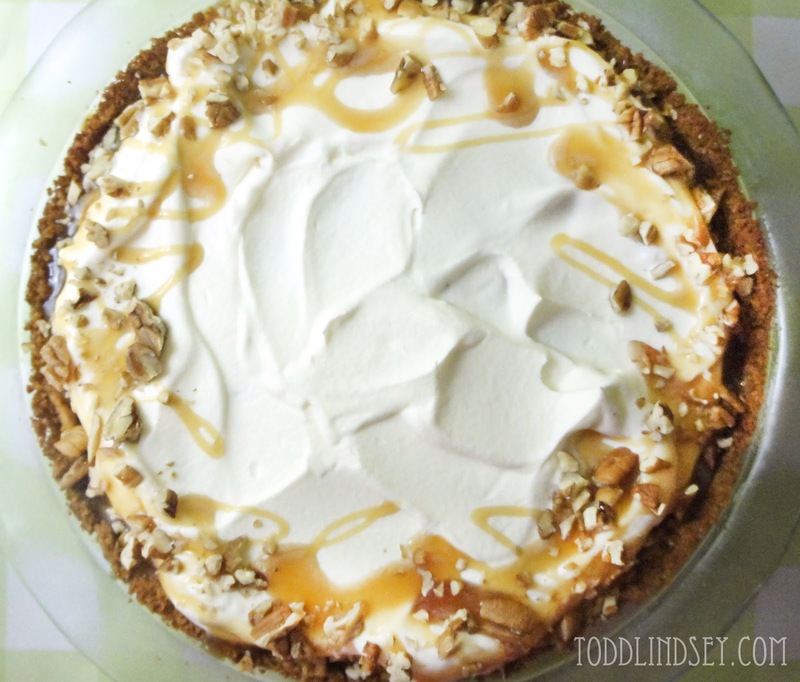 One of Todd's favorite desserts is apple pie. So I made him one. This is the BEST apple pie I have EVER made. The crust is a graham cracker base coated in caramel sauce and chopped pecans. 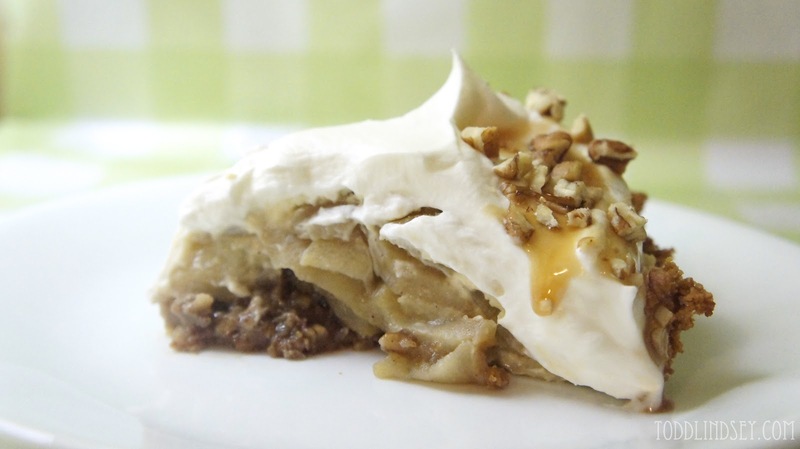 The apple filling is perfectly cooked with nice, thin slices. The top has not one but two amazing layers. 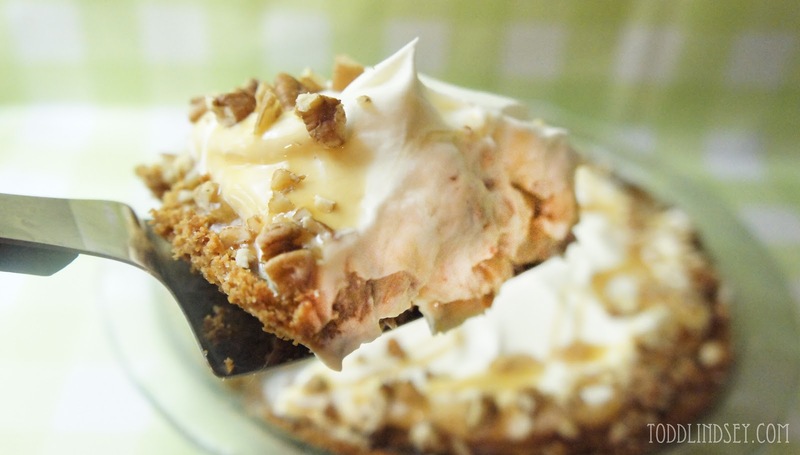 The first layer is a cream cheese based topping and the second layer is homemade whipped cream. The entire thing is decadently topped with yet more caramel sauce and chopped pecans. Can you say YUM?! 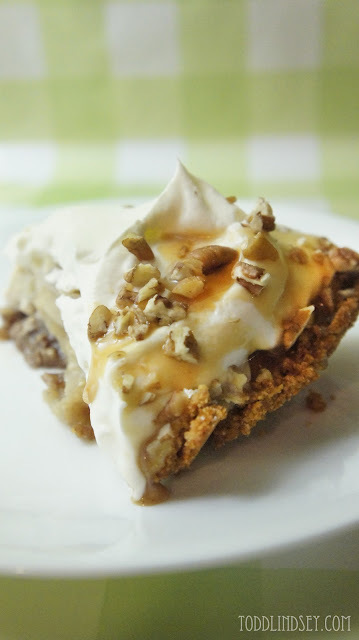 I don't even like cream cheese in my desserts but wow. This. Was. Amazing. 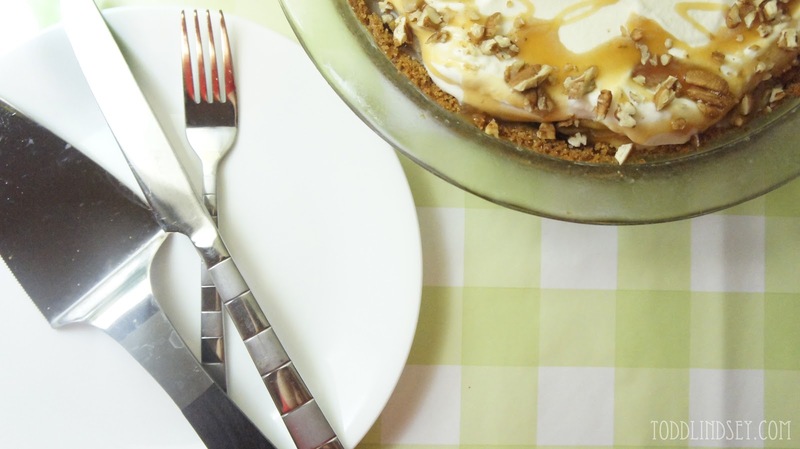 You start by mixing melted butter, graham cracker crumbs, sugar and cinnamon together in a medium bowl. 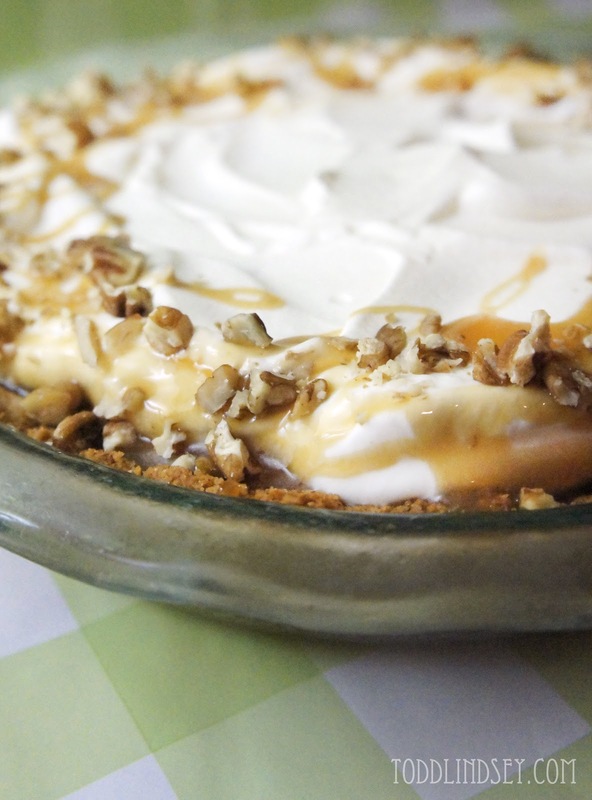 You press it into a greased pie pan. Or you could use a spring form pan, now that I think about it. 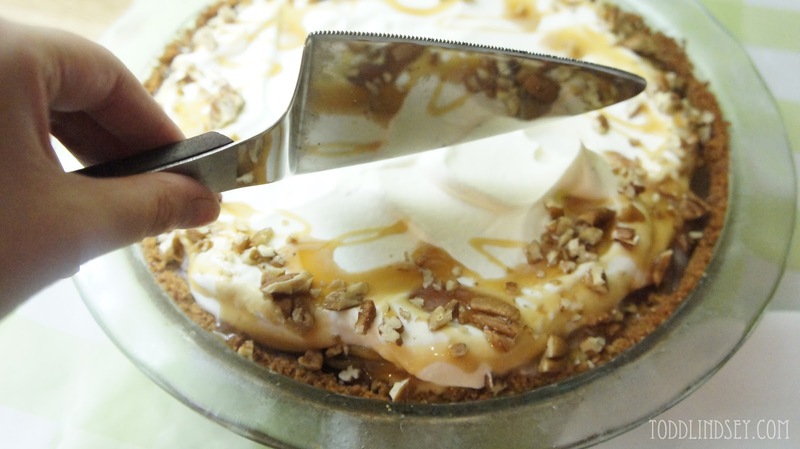 That certainly would have made slicing easier. Bake the crust at 375* for eight minutes and then cool completely. I stuck mine in the fridge once the glass was only slightly warm to the touch. 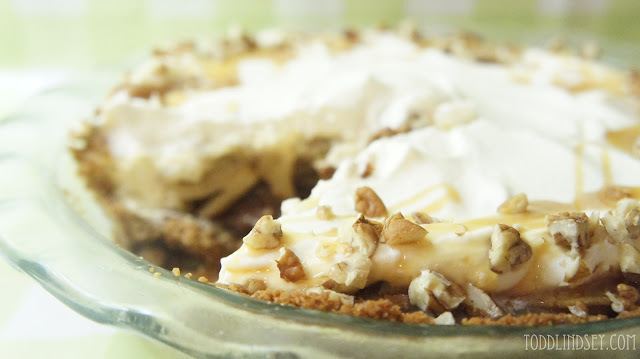 Cover the bottom of the pie crust with gooey caramel sauce and then sprinkle with chopped pecans. 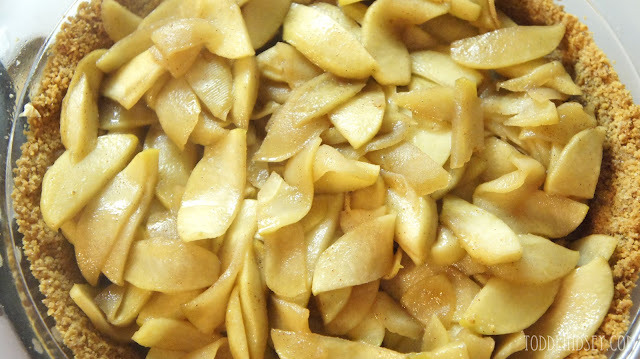 While the crust is cooling, peel, core and thinly slice 5-6 Granny Smith apples. Five medium sized apples or six small. ... and cook for 15-20 minutes or until nice and tender. 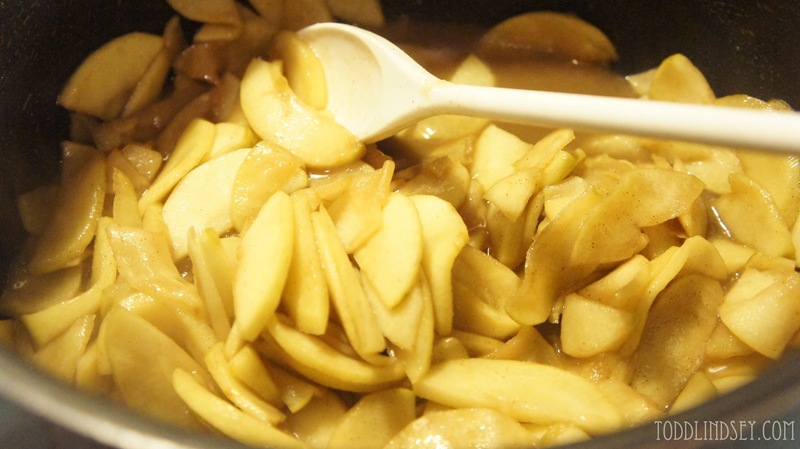 Let the apples cool for about 10 minutes or so. 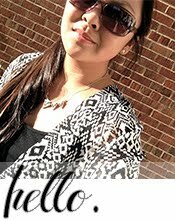 Don't waste any time! 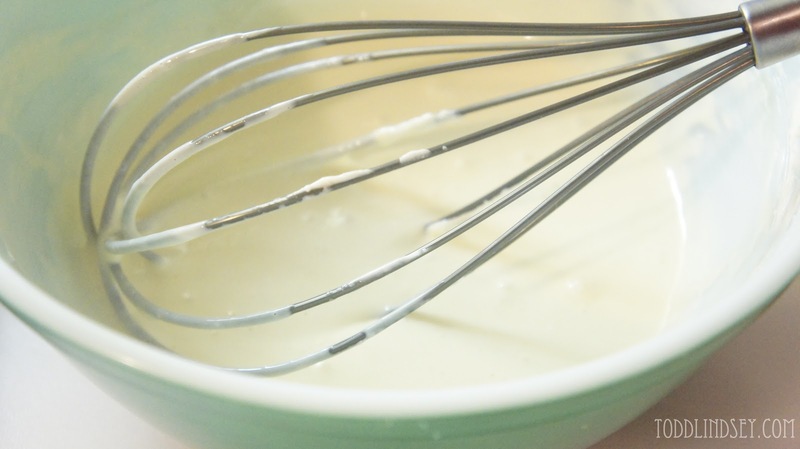 Start whipping the cream cheese and sugar together. 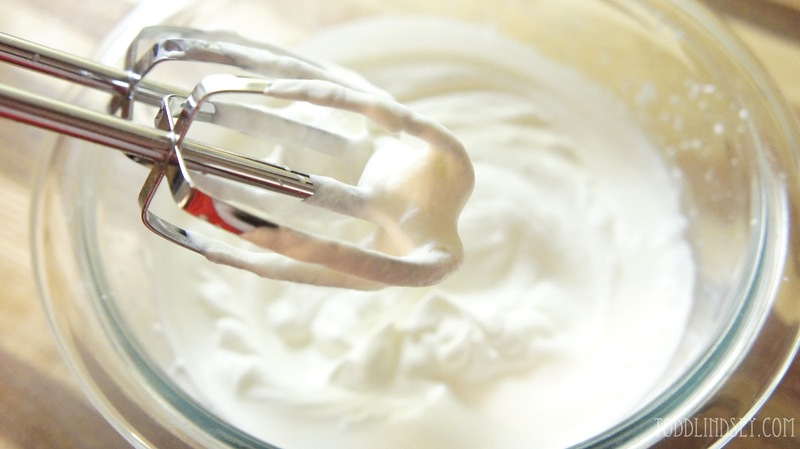 You can use an electric mixer if you want. 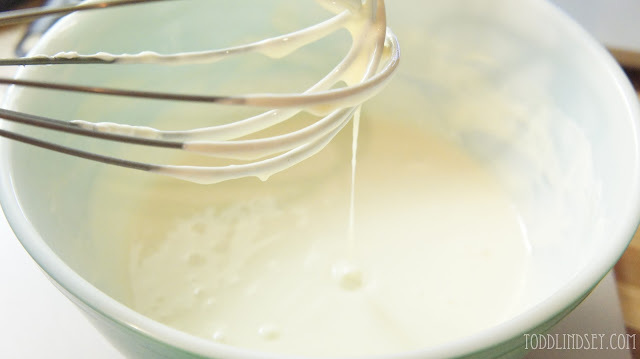 Add an egg, lemon extract and vanilla. Dump the apples into the caramel-and-pecan-coated pie crust. It looks so happy already, doesn't it? And bake at 350* for 30 minutes or until a toothpick comes out clean. 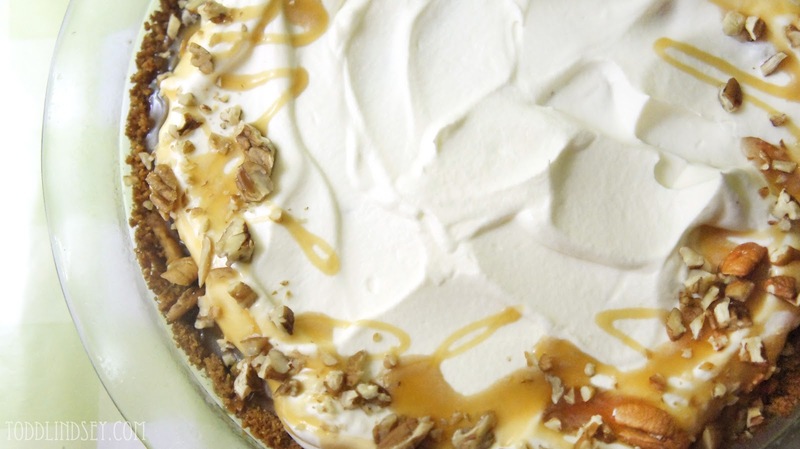 Let the pie cool completely. I let mine get warm and then I stuck it in the fridge for about 30 minutes. Then I transferred it into the freezer for another hour. The instructions said chill in the fridge for 4 hours. FOUR HOURS?! Are you kidding me?! Not happening. Whip that cream and sugar. And spread it all over the top, nice and pretty-like. Drizzle extra caramel sauce and chopped pecans on the edge. 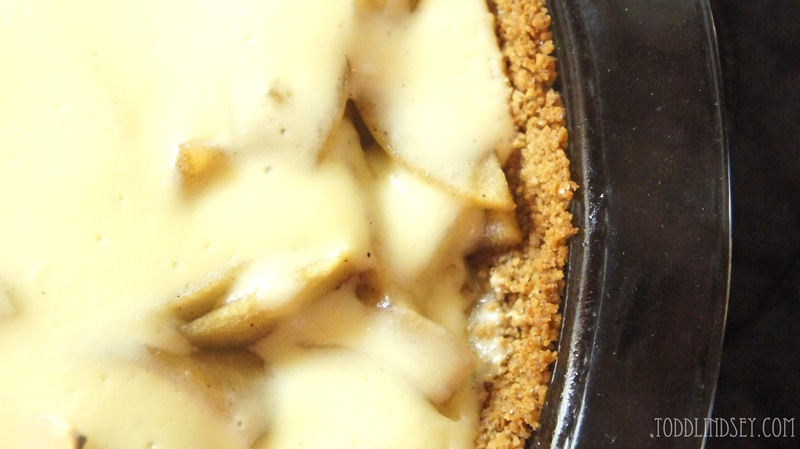 Preheat the oven to 375* and spray a pie plate with nonstick spray. 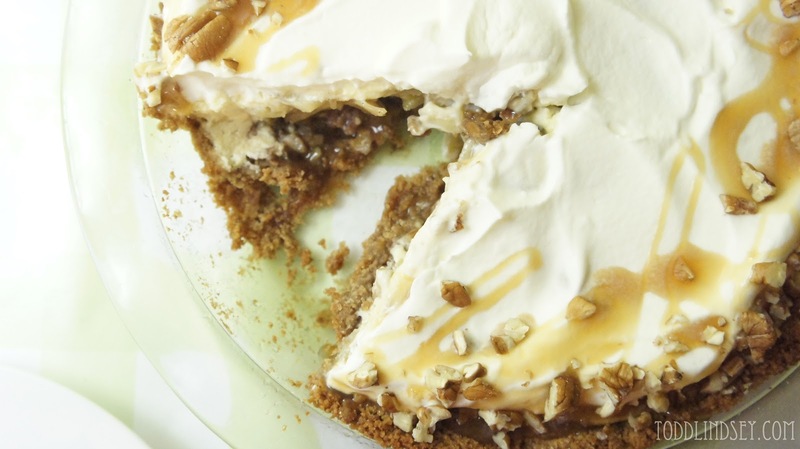 In a medium bowl, combine all the crust ingredients except the caramel sauce and pecans. 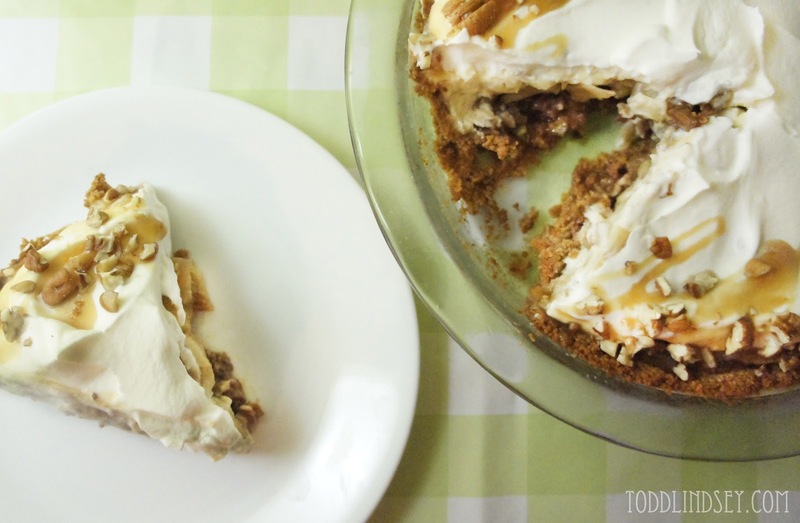 Press into the pie plate and bake for 8 minutes. 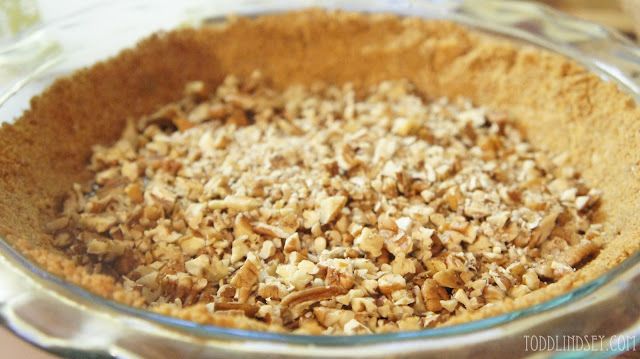 Reduce the oven to 350* and let the pie crust completely cool. 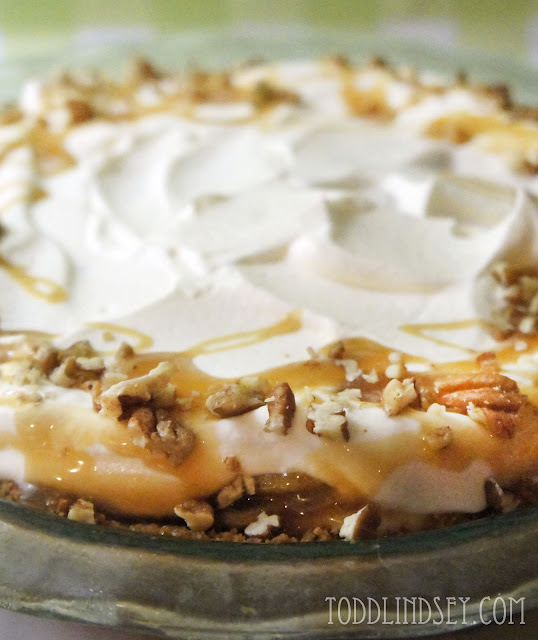 Once the crust has cooled, pour the caramel sauce onto the base of the crust and sprinkle with the chopped pecans. 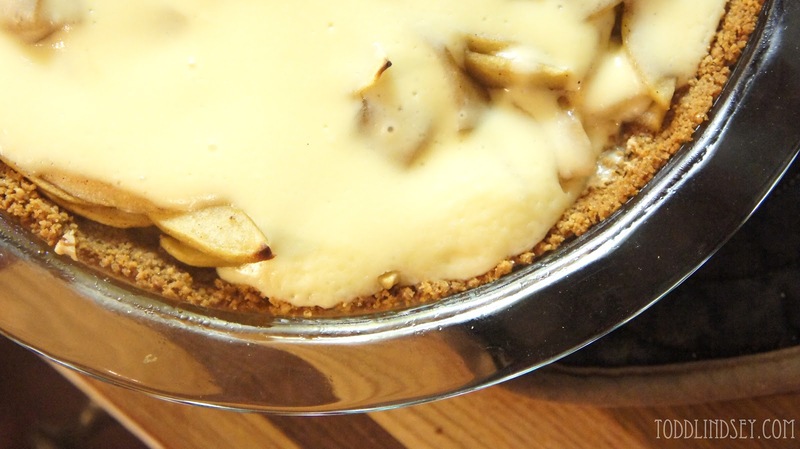 In a large skillet or pot, melt the butter, sugar, salt and cinnamon together. 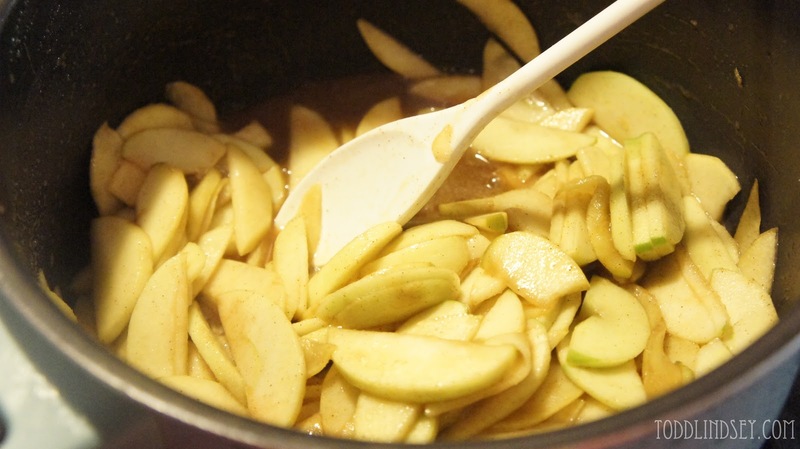 Add the apples and cook on medium heat for 15-20 minutes or until softened. Let the apples cool for 10 minutes. Cream the cream cheese and sugar together in a medium bowl. Add the egg, lemon extract and vanilla and mix to combine. 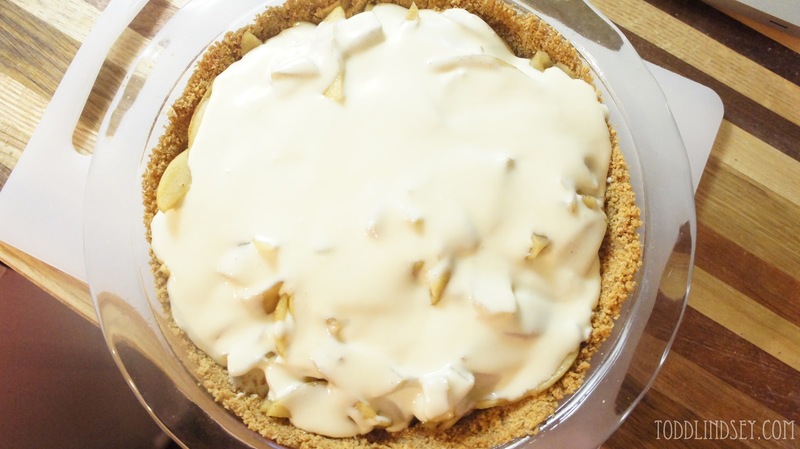 Pour the apples into the pie crust and top with the cream cheese mixture. Let the pie cool completely and then place in the freezer for one hour. 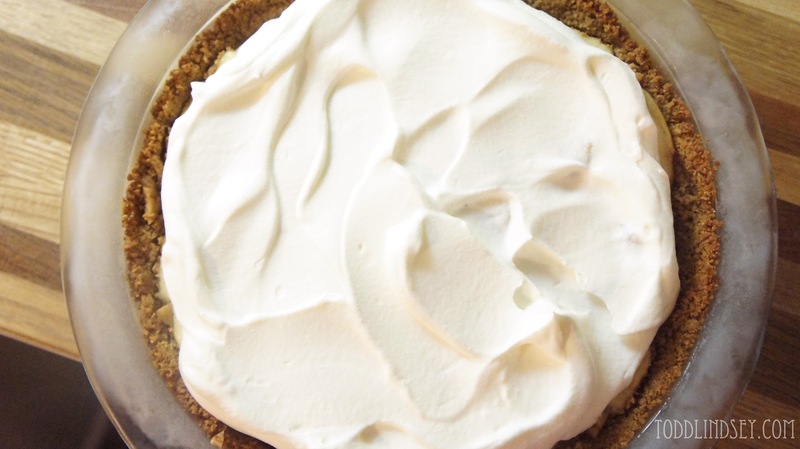 Whip the cream and sugar together and spread over the top of the chilled pie. 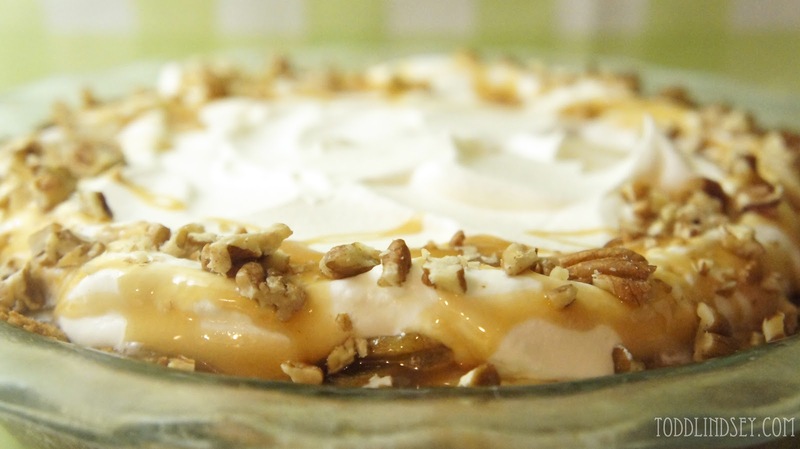 Garnish with caramel sauce and chopped pecans. 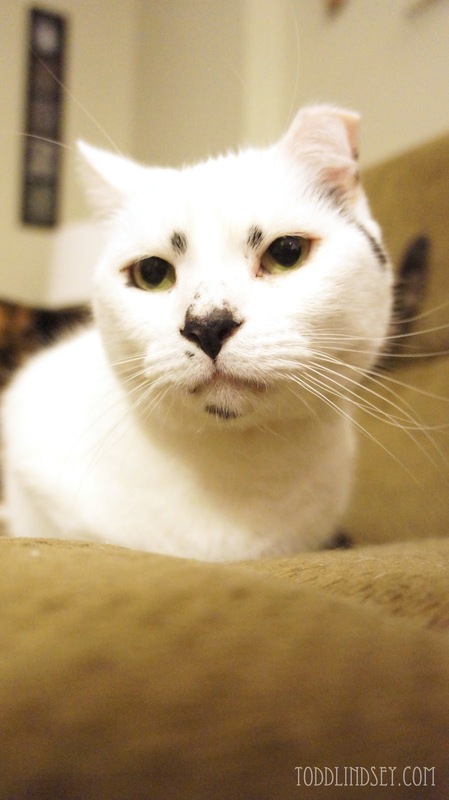 And meet my kitty, Jose.